Since 2001, the Gallup Management Journal has provided leaders with essential insights into managing the human side of their businesses - their employees and customers. This book features the highlights of the first seven years of the GMJ: more than 50 thought-provoking articles with actionable ideas, grounded in decades of Gallup management research. The Best of the Gallup Management Journal 2001-2007 could not be more relevant today, as executives continue to struggle with the transition into a 21st century global economy. Many leaders have reengineered and reorganized their companies numerous times. But what remains is the biggest business challenge of all: improving and perfecting relationships with customers and with the employees who engage them. More than anything, executives and managers need quantifiable, measurable strategies for making the "intangible" side of their businesses as productive and profitable as it can be. For years, "hard-headed" business leaders and gurus have said that it's impossible to measure these intangibles. The GMJ argues that they're wrong, and this book offers proof. Drawing on interviews with millions of employees and customers worldwide, the articles and interviews in these pages cover topics such as the best way to get meaningful employee feedback, why customer satisfaction is the wrong measure, the 12 elements of great managing, why most advertising doesn't work, and the impact of positive leadership. A range of voices from within and outside of Gallup is included in these pages. A Ritz-Carlton executive tells how his company is reinventing its world-class brand, while a leader at Ann Taylor describes how the retailer invests in talent. Nobel Prize winner Daniel Kahneman probes how customers think, while one of the inventors of the Internet, Vinton Cerf, speculates on the future of his creation. 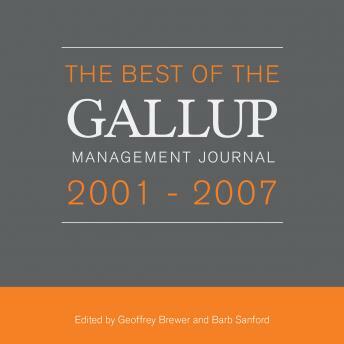 With its lively writing and penetrating, research-driven insights, The Best of the Gallup Management Journal 2001-2007 is essential reading for leaders who want to engage employees and customers in a hyper-competitive and ever-changing global economy.